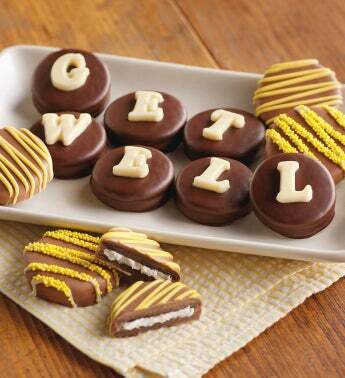 Send warm wishes with a sweet treat to raise someone's spirits. These special confections are the perfect blend of crunchy sandwich cookies and rich Belgian chocolate in milk and dark varieties, with a message of "Get Well" spelled out in white chocolate on top. These artisanal cookies are handcrafted in small batches, and arrive in an elegant gift box that shows just how much you care.